Save $20 by purchasing our Summer Barn Dance Season Pass! 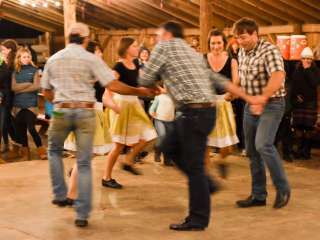 Enjoy our entire line-up of musical talent throughout the entire summer, bring your dancing shoes, and jump right to the front of the line during our Friday Barn Dances. This year’s season pass holder can enjoy the following performances at Hickory Nut Gap Farm: May 10th (6pm-9pm): Sparrow and Her Wingmen May 24th (6pm-10pm): West End String Band June 7th (6pm-9pm): Cane Creek Hellbenders June 21st (6pm-10pm): Laurel Lee and the Escapees July 5th (6pm-9pm): Hearts Gone South July 19th (6pm-10pm): Jesse Barry and the Jam August 2nd (6pm-9pm): Lazy Birds August 16th (6pm-10pm): Spring Mountain Shiners September 20th (6pm-9pm): Deep River October 4th (6pm-10pm): Trusty Hucksters October 18th (6pm-9pm): Zydeco Ya Ya Dinner and drinks will be served buffet style each night for a separate fee, with a delicious line up of HNG Meats and Sides from our catering culinary team. So bring your appetites! Season passes on sale until May 10th, 2019.